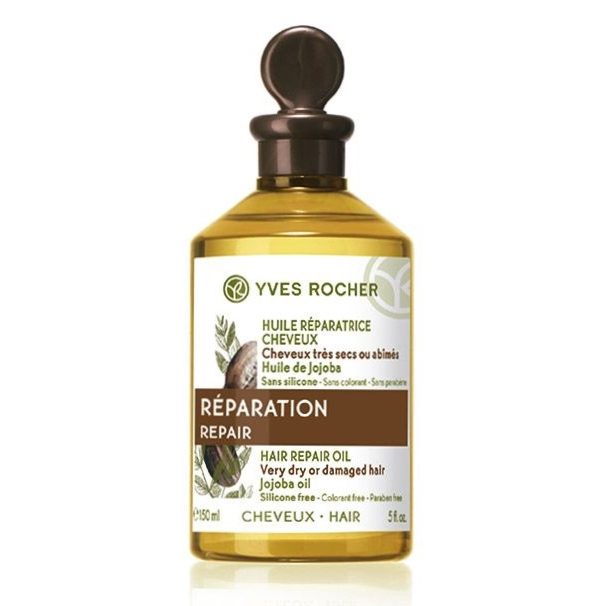 Yves Roche Hair Repair Oil is a French proposition for hair that needs restoration and nutrients. Thanks to a quite good selection of active ingredients, the product presents the hair with extraordinary care. It has amazing nourishing and protecting properties and prevents hair dehydration. … are confirmed by many opinions. When you apply it, you feel your hair is softer and shinier and smells beautiful. It is non-greasy and non-overburdening. Yves Rocher Hair Repair Oil enhances gloss and makes it easier to detangle the strands without pulling and tearing. … is very interesting and natural. There are no unwanted silicones that are included in most hair care products. Yves Rocher Hair Oil is formulated without alcohols, preservatives and fragrances that are placed on the list of potential allergens. On the other hand, it contains vitamin E and natural vegetable oils. … has a very mild and pleasant aroma that coats the hair with a delicate mist. It is not too sweet. The oil is more fluid than other oils. Therefore, it is well absorbed in the hair. You don’t need to apply big amounts to cover the hair evenly. That is why, Yves Rocher Hair Repair Oil is very cost-effective. … are clearly defined. Sadly, we cannot give full rein to our imagination. You apply the product to dry hair about 10 minutes before washing, spreading it evenly. For more intensive action, feel free to put on a towel (soaked in warm water) – Yves Rocher Repair Oil will be absorbed more quickly. Next, wash it off and shampoo the hair as always. … is quite big. A large 150 ml bottle is secured with a refined brown cap. A straw colour of the oil breaks through the walls of the clear plastic. Regrettably, the manufacturer didn’t pay attention to the applicator that is not easy to use.